With Chinese New Year just around the corner it’s a perfect time to give The Fortune Pig a spin. This colourful 5 reel, 25 payline slot is based on the arrival of the Year of the Pig. The game comes with a couple of potentially exciting extras including streak re-spins and a Fortune Free Spins feature with synced reels. Also boosting your winning chances are stacked wilds that can land on any spin. A barn full of cash is the setting for the second new arrival, Chicken Fox, a 5 reel, 30 payline slot from Lightning Box Games. The design here is as madcap as you might expect. The main extra is the Free Games feature that awards up to 30 free spins. These take place on reels that only include blank, chicken, egg and fox symbols. Each chicken symbol comes with a coin value attached which can be anything up to 33.33 times your stake. You can get 2x multipliers here too with wins of up to 13,500 times your stake! Enjoy front row seats to a classic variety show in Cabaret Royale. Created by 2 by 2 Gaming, this unusual slot is played using an 8 reel, 60 payline game engine. Classily designed, it comes with special Encore payouts that can double your reward. Also on offer are a trio of feature rounds that award up to 30 free spins with wild reels, extra Encore payouts or a combination of both. This is one performance you won’t want to miss. Go hunting for a pot of treasure in Rainbow Riches Leprechauns Gold. This 7 reel, 50 payline is the first of 2 Barcrest slots to launch this week. It comes with the colourful design you’d expect as transforming symbols and a feature round that awards up to 25 free spins. Up the stakes and activate Big Bet Mode and you’ll bring the special Rainbow Reels into play. Look out for wild scatter cash bonuses and a bigger than usual paytable during this mode. 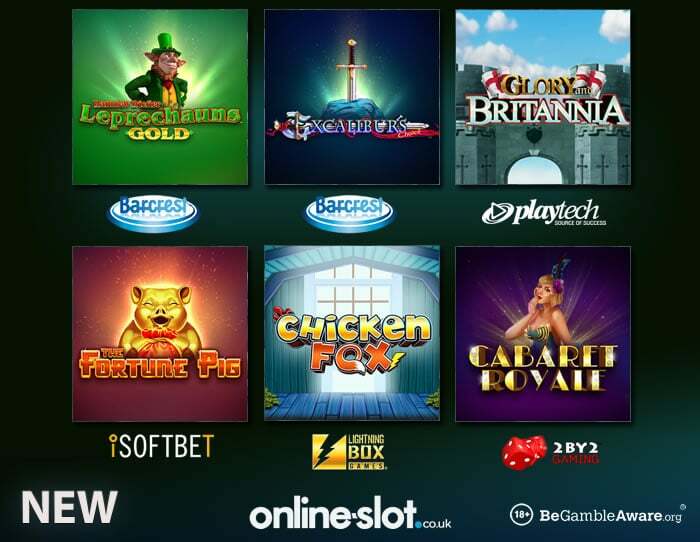 If you’ve liked the other Rainbow Riches slots, you should find plenty to enjoy here. There’s also a second new release from Barcrest. Excalibur’s Choice is a simple 5 reel, 10 payline slot that takes players back to Camelot, the home of the King Arthur. It’s not the flashiest looking slot you’ll see and the range of extras isn’t wide. Trigger the bonus round though and you’ll get up to 20 free spins complete with special expanding symbols that fill whole reels whenever they hit. These special expanders also pay scatter style. It’s not much of a looker but the 5 of a kind winners can deliver some potentially legendary results. Rounding out the new releases is Glory and Britannia which is powered by Playtech. With 5 reels and 243 ways to win, this medieval themed title is all about the 7 legendary Britons – you can activate them at any time to give you re-spins with low value symbols removed, stacked treasure chests, spreading winning clusters, wild reels, multipliers up to 5x, more free spins and random wilds. There’s also a Free Spins feature where you’ll play on a 1,024 ways to win engine. For more new slots, visit out dedicated section or keep up to date via our News section.